Peoples Democratic Party (PDP) governors have rejected what they see as a plot by some of their colleagues to impose a presidential candidate on the party. Instead, the governors have offered to meet with the 12 presidential aspirants this week on their commitment to free and fair primaries. 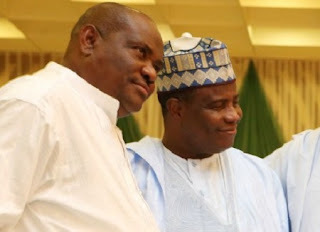 The governors, who met in Abuja on Sunday, were said to have discovered that “one or two” of them had “ulterior agenda” to impose a candidate on the party. It was learnt that the governors also came up with the idea of a consensus candidate, but others claimed it was too early to decide that. The party, Board of Trustees (BoT) is canvasing consensus, saying the number of candidate is high. A governor, who spoke in confidence with our correspondent, said: “We had a stormy session because we have one or two among us without an open mind. They are working to the answer for one candidate. “We know these governors and in the fullness of time, we will expose them before they destroy our party and ruin its chances in 2019. “Most of us said anybody working with agenda contrary to free and fair process will be resisted. We said we will like a fair game because PDP must get it right this time around. “So, anybody with ulterior agenda is deceiving himself. No PDP governor or governors can force a process on us. We want the party to put the best candidate forward. The governors will meet with the 12 presidential aspirants before the end of this week to, according to another governor, “reassure them of our commitment to equity, fairness and justice”. The source went on: “We also seek to appeal to the aspirants to play the game in a fair manner which will keep PDP intact. They should see themselves as members of the same family. “The governors will also like to hear suggestions from the aspirants on the forthcoming primaries because Nigerians are looking forward to us to get it right. BoT Chairman Walid Jibrin, yesterday told our correspondent in an SMS message, that the committee would impress it on the aspirants the dangers inherent in having such a large number of them in the race. Describing the number of aspirants as unwieldy, Jibrin said there were fears that there could be disagreement among the contestants that could lead to major divisions after the primaries. The BoT chair, however said the committee would not compel any of the aspirants to withdraw from the race adding that “rather, they would be persuaded to put the interest of the party above their personal interests and ambitions”. Jibrin continued: “A committee has been set up to discuss with all the aspirants to come up with one of them as a consensus candidate. We have 12 of them in the race. “We have also advised the leadership of the party to regulate the processes and draw a code of conduct to guide the conduct and behaviour of the aspirants and officials to be engaged in the selection process. Jibrin, whose tenure has been renewed for another five years, urged members of the BoT to always maintain their honour and integrity by remaining neutral in all the processes leading to the emergence of a candidate. In the race for the party’s presidential ticket are former Vice-President Atiku Abubakar; Sokoto State Governor Aminu Tambuwal; Gombe State Governor Ibrahim Dankwabo; Senate President Bukola Saraki; former Jigawa State Governor Sule Lamido; former Kaduna State Governor Ahmed Makarfi and a former Special Duties Minister Tanimu Turaki. Others are former Senate President David Mark; former Kano State Governor Rabiu Musa Kwankwaso; former Sokoto State Governor Attahiru Bafarawa; former Plateau State Governor Jonah Jang; and Senator Baba Datti Ahmed. Of the aspirants, 11 have returned their nomination forms. Saraki was being expected to submit his as at 5pm yesterday. Going by the party’s guidelines, nominations for the presidential slot will close today (Tuesday). To Saraki, consensus “is not the issue”. He spoke yesterday at the party’s Abuja secretariat shortly after submitted his nomination papers. Saraki said: “I don’t think the consensus thing is the issue before us because we are trying to ensure that there is internal democracy in the system and very credible primaries. “What is important is that at the end of the day, we have something that is rancour free. What I can tell you is that we are working together because we are still part of one family. Stating that the PDP is not Nigeria’s problem, as being projected by the ruling party, the aspirant promised to unite all sections of the county if elected president. He said: “What is important for us is the lives of millions of Nigerians who are going through such a tough time and who now believe that it is only through the PDP that that can happen. “We will play our own part in ensuring that we unite everybody. It has always been my antecedent to provide unity, to provide leadership in this kind of scenario. “I can assure you I will play my role in uniting all of us because we are part of one family. Our problem is not in PDP but in the other party. Deploring youth unemployment, Saraki said it was time for the youth to elect someone who has energy, youthfulness, capacity and knowledge to take the country to its desired level.